More than 100 chair caners from across the nation will participate in the conference at the Folk Art Center’s Auditorium. Saturday’s workshops and sessions are open to the public for a fee of $105, which includes catered lunch, dinner, snacks, beverages and annual membership in The SeatWeavers’ Guild. Saturday’s conference runs from 10am-8:30pm. Sunday’s SeatWeaving Roadshow is FREE and open to all ages from 12-4pm in the Folk Art Center’s Auditorium. 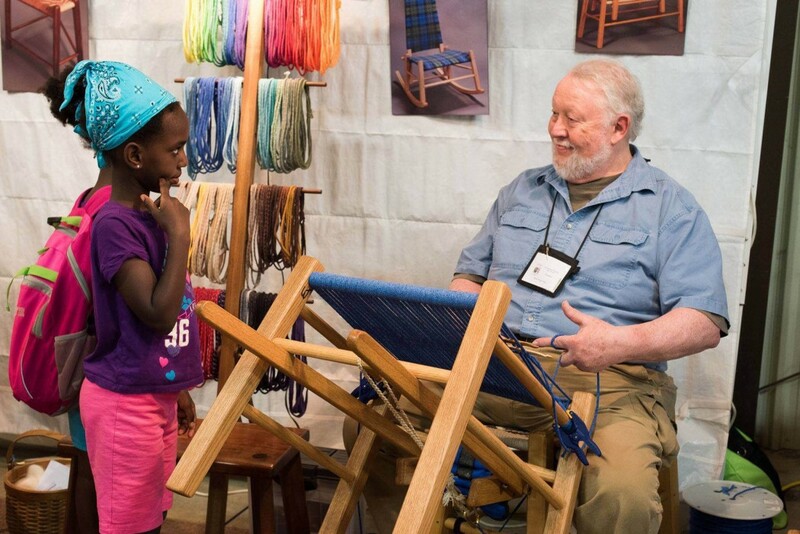 Attendees will enjoy demonstrations by guild members showcasing the various methods and materials used in chair caning and seat weaving such as corn shucks, cattail rush, and upcycled belt weaving. Visitors are encouraged to step up to a chair and practice weaving themselves. Hands-on weaving stations include hand-woven caning, machine-woven caning, rush weaving, splint weaving, Shaker tape weaving, and Danish cord weaving. Educational displays and special exhibits will be on site including Appalachian Contemporary Chairmakers with Woven Seats and Corn Shuck Chairs from NC, SC, GA, and TN. The SeatWeavers’ Guild, Inc. is a nonprofit educational group organized to promote and perpetuate the age-old craft of chair seat weaving. Members are craftsmen, teachers, and restoration artists with a deep desire to pass on the seat weaving trade. Previous host locations of the annual gathering include Robbins Crossing Historical Village in Ohio, Sturbridge Village of Massachusetts, Brown County State Park in Indiana, and Old World Village in Wisconsin. Silver River is the nation’s only chair caning school and museum, located at CURVE Studios & Garden in Asheville’s River Arts District. For more information on chair caning classes, restorations and the museum, visit silverriverchairs.com.